Home » Technical Libirary » Industry knowledge » What is Cold-Rolled Sheet Pile ? What is Cold-Rolled Sheet Pile ? The cold-rolled sheet piles or we call it as cold-formed sheet piles are manufactured by cold-rolled production lines. The cold-rolling process includes rolling the sheet pile profile continuously at room temperature, which is a step-by-step process rather than bending process. 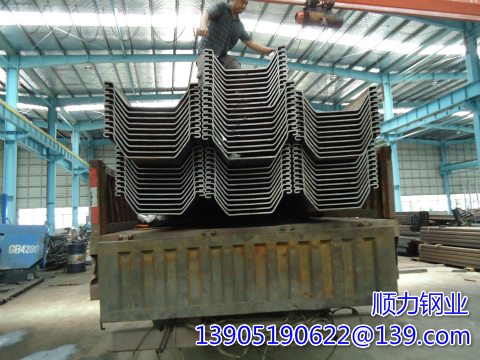 The sheet pile thickness is constant along the width of the sheet pile. Cold-rolling occurs in a continuous section which can be cut at any length. A wide range of widths and depths are available. Production schedules are much more flexible than hot-rolled sheet piles, which can lead to cost-savings due to lower stock requirements and greater project-specific profiles and lengths. ShunliSteel could offer one of the thickest cold-rolled sheet piles (maximum 16mm @ steel grade S430) in the world that can be manufactured through using the cold-rolled production lines without any compromise in structural properties. Shunli could offer 4 different types of cold-rolled sheet piles which cover all applications – both temporary and permanent projects. ShunliSteel’s cold-rolled sheet piles have been used as an equivalent and effective alternative option to the hot-rolled sheet piles, with possible cost savings of over 20% while without any compromise in quality, design or section properties. ShunliSteel’s have been successfully been used in worldwide projects and different regions.